Cabo San Lucas and the surrounding area has a vibrant underwater marine life to discover. Exploring the crystal-clear underwater world is refreshing, relaxing and fascinating and will sure to be a memorable adventure. You will encounter numerous tropical fish and other sea creatures that inhabit these beautiful waters. After relaxing by the poolside of your vacation rental, venture out to snorkel and dive on your own or schedule a tour for a boat ride to various destinations. Pelican Rock near the famous Los Arcos Arch, Santa Maria, or Chileno Bay are some locations where your time under the water will be an enjoyable experience. One available tour will take you beyond the hotel zone in San Jose del Cabo to secluded coves and isolated beaches for the ultimate snorkel excursion. The tour also includes stand-up paddle boarding, kayaking, and a comfortable, Apex high-speed boat ride. Lover’s Beach (Playa de Amor) is located on the Sea of Cortez side near the famous stone arch (El Arco). The only access to this beach is by water taxi from the marina or Medano Beach. Make sure to arrange for your return trip. Swimming and snorkeling is good on the Sea of Cortez side depending upon the water conditions. This beach is crowded so be aware. Another beach that should be top on your list is Santa Maria Beach. This beach boast calm, clear waters which is perfect for diving, snorkeling, and swimming. It is claimed as a marine sanctuary with an abundance of tropical fish. This beach is great for families. Remember to bring your own snorkel gear, water and snacks if you’re going to venture on your own. This is a perfect spot for snorkeling due to the quiet setting and great rock outcroppings. You will encounter royal blue and yellow damsel fish, cow fish, parrot fish, urchins, coral, and long nose hawk fish. Great for families, snorkeling and diving. 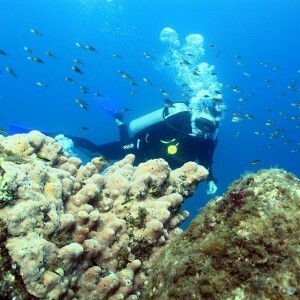 Several reefs are situated in these calm, clear waters with an abundance of marine life consisting of over 80 species. The long finger type coral reefs attract a lot of sea life. You will encounter damselfish, sergeant majors, yellowtail surgeonfish and Moray eels can be found and in the deep cracks in the reef. This bay great for beginner snorkelers because of clear and shallow waters. 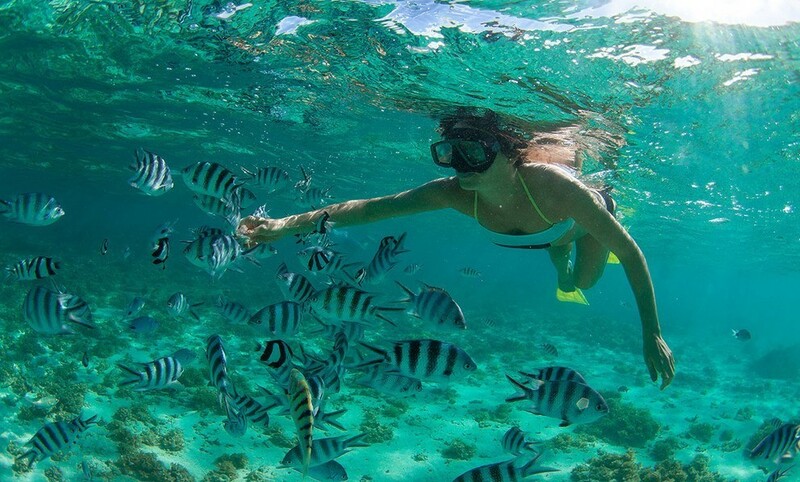 This is a popular destination for snorkel excursions, so it might be busy in the water. Discover the tiny town of Zacatitos where you can snorkel at healthy coral reefs with a plethora of marine life. We recommend booking a tour as the drive is about two hours out of Cabo San Lucas and it’s a bumpy, windy, and crazy. 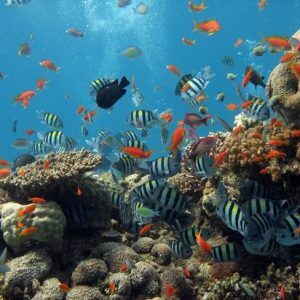 Cabo Pulmo, a small village with a 17,571-acre Marine Protected Area (MPA), has the best diving and snorkeling in Baja. 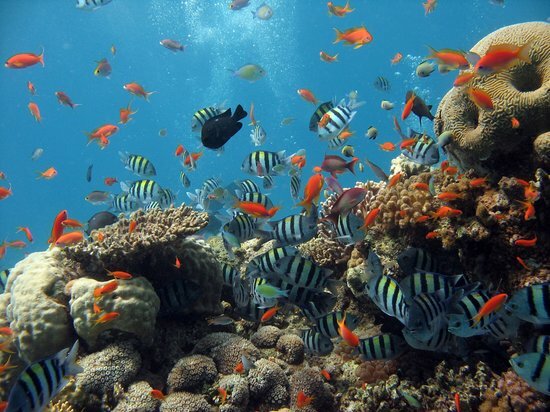 It’s also home to the only Pacific coral reef in the Sea of Cortez. John Steinbeck wrote about these ancient reefs in his 1951 book The Log from the Sea of Cortez. Close proximity is another UNESCO World Heritage site located at the Cerralvo and Espiritu Santu Islands. Scuba diving in Cabo San Lucas offers divers of all levels a unique and wondrous diving experience. Diving in Southern Baja will be an exciting and memorable experience with caves, coral reefs and shipwrecks to explore and discover. With over 800 fish species that inhabit these waters and prime conditions will make your diving adventure a remarkable experience. Located in the Cabo San Lucas Bay along the rocky cliffs towards the famous Land’s End arch, this area provides dives starting at 20 ft depths. There is plenty to discover, including puffers, goat fish, parrot fish, angels and eels. Other common marine life are lobsters, jacks, rays and the occasional reef shark. Jacques Cousteau’s discovered this area also known as the Sand Falls. Also located in Cabo Bay, this dive brings you the usual colorful display of tropical fish and you may also receive a visit from a sea turtle. This is one of the best locations for beginning divers also located in Cabos San Lucas Bay. This also offers the usual beautiful display of marine life. Dives start out around 25 ft depth with an abundance of tropical fish, lobsters, hawkfish, eels, and even schools of tuna. Currents are strong in this area is best suited for the experienced diver. Claimed as marine sanctuary’s with an abundance of tropical fish. You will encounter royal blue and yellow damsel fish, cow fish, parrot fish, urchins, coral, and long nose hawk fish. Corals and sea fans among the ridges decorate the reef. Gordo Banks is for experienced divers only with the top of the seamount at 110 ft depth and with strong currents. You will encounter large gatherings of hammerhead sharks, whale sharks, marlin, and swordfish. Best diving time is seasonal during August through November. This region offers dozens of near shore and off shore diving sites. Suited for all levels of divers the diving sites include Punta Pescadero, Cerro Verde, Rancho Buena Vista Reef, El Cardonal and Punta Perico. For the more experienced diver, discover Punta de la Ventana where, with the right conditions, you can explore caves and encounter grouper, jewfish and sea bass. This UNESCO World Heritage site is another must-dive adventure to experience with spectacular and vibrant coral reefs found in this marine protected area. Cabo Pulmo National Park has the best diving and snorkeling in Baja and is home to the only Pacific hard coral reef in the Sea of Cortez. The abundant coral growth on the rocky reefs provides shelter and food for countless reef fish, many of which are found nowhere else in the world. 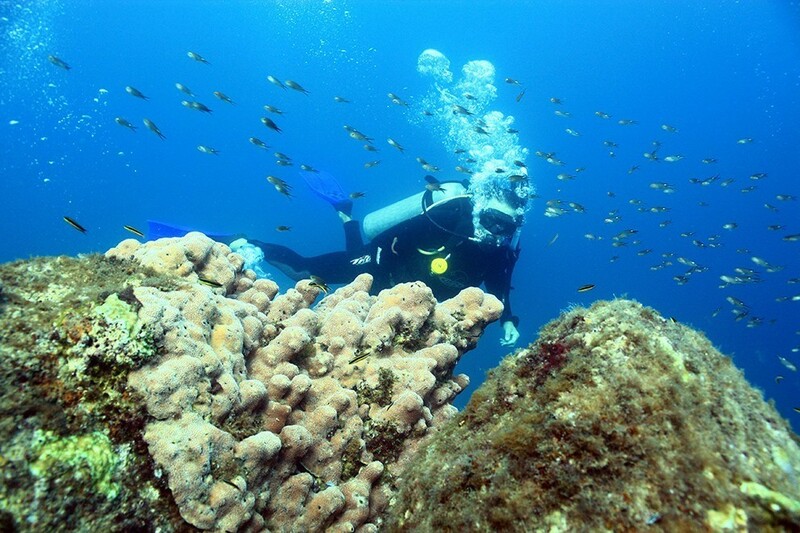 The diving sites include Bahia Las Barracas to the north and Bahia Los Frailes to the south. If you want to venture further North, La Paz is another great dive destination. In close proximity is another UNESCO World Heritage site located at the Cerralvo and Espiritu Santu Islands. These islands provide dozens of dive sites, with a cave that has an air chamber that allows divers to surface while inside. From first time divers to those looking for all levels PADI certifications, Cabo Adventures offers everything you will need. With the most experienced staff and the best and most well-equipped dive boat in Cabo, you are sure to have a safe and amazing dive adventure.